¶Above orographically structured terrain considerable differences of the regional wind field may be identified during large-scale extreme wind events. So far, these regional differences could not be resolved by climate models. 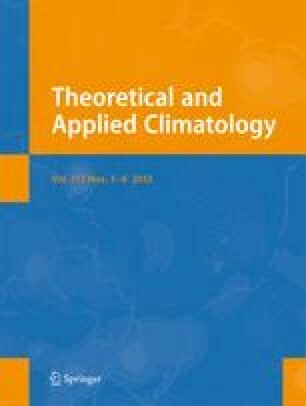 To determine the relationships between large-scale atmospheric conditions, the influence of orography, and the regional wind field, data measured in the upper Rhine valley within the framework of the REKLIP Regional Climate Project were analyzed and calculations were made using the KAMM mesoscale model. In the area of the upper Rhine valley, ratios of the wind velocity in the Rhine valley at 10 m above ground level, νval, and the large-scale flow velocity, νlar, are between νval/νlar ≈ 0.1 and νval/νlar ≈ 1. The νval/νlar ratio exhibits a strong dependence on thermal stratification, δ, and decreases from νval/νlar ≈ 1 at δ = 0 K m−1 to νval/νlar ≈ 0.2 at δ = 0.0075 K m−1. In areas, where the lateral mountainous border of the Rhine valley is interrupted, the νval/νlar ratio increases again with increasing stability or decreasing Froude number. This is obviously due to flow around the Black Forest under stable stratification. It is demonstrated by model calculations that a complex wind field develops in the Rhine valley at small Froude numbers (Fr < 1) irrespective of the direction of large-scale flow. The νval/νlar ratio is characterized by small values in the direct lee side (νval/νlar ≈ 0.2) and high values on the windward side of the lateral mountainous border of the Rhine valley (νval/νlar ≈ 0.8).